To read the entire newsletter click here. Now it is time to hand the reigns to Paola Tanner and Esther Cooke, two young mothers with a passion for healthy food for their families and a desire to share the passion with all of you. I could not have dreamt of better custodians for The Garden Shed and Pantry. Over the next couple of months they will be learning everything about the ins and outs of every single item I stock; the growers, the ethics, the pricing, the newsletters and the needs of you, the customers. No stone will be left unturned! I am not leaving Cygnet and I will continue with my sourdough and other workshops. 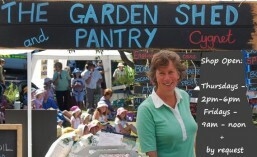 Please come to the Cygnet Market this Sunday and meet Esther who will be helping me on my stall. She is a warm, cheerful, knowledgeable, community spirited woman who I first met through Crop Swap. I am confident you will all smile when you meet her. Listen today or find the podcast online later. An enlightening interview with Lisa, who grows, packages and sells the saffron at Glen Huon. Hers is the saffron I sell too and her ethics perfectly align with mine. Lisa and her saffron will also be on ABC Landline at a time to be announced. Autumn is here and in our gardens there is abundance of seeds and nuts and dried beans. And so it is that our bodies are telling us we need seeds, nuts and dried beans and peas too. Check out my chickpea tagine recipe, and other, below…. Fresh is extremely important with nuts and seeds as they contain a lot of oil which quickly goes rancid, once the nuts are cracked from their shells and exposed to air. I have continuous, fresh supplies. Read more about nuts and their enzymes, below …. The Garden Shed and Pantry will be closed from December 23rd to February 1st and I will not be at any January markets. Someone keeps removing my garden Shed and Pantry sign from the tree at the entrance to my driveway and throwing it in the bushes! Now it has disappeared altogether but THE GARDEN SHED AND PANTRY IS STILL OPEN AT MY REGULAR TIMES SO DO DRIVE IN. One of my promises to you, my customers, is that whatever I sell you will always be fresh and that includes all flours and grains. So as not to have supplies languishing in my store room over January, when I am closed, I am selling off all remaining Four Leaf flours and grains at 10% off, to clear the decks before Christmas! This includes at my home and both December markets. If you come to my home shop I will give you an even better deal for larger purchases. But be quick, as supplies are dwindling already. No matter how much he makes, it always sells out! Be early and don’t go home disappointed! Natural Therapies offered by my amazing house sitters! Offering a wonderful range of deep relaxing therapeutic treatments in Cygnet, surrounded by beautiful nature and gardens. Reflexology, Pregnancy Reflexology, Infertility Reflexology, Reiki and Classical Homoeopathy. We treat a variety of health issues or just come in relax, de stress and rejuvenate. Some of the issues that can be treated: joint/back/knee/shoulder pains, headaches, migraines, menstrual difficulties, menopause, pregnancy conditions, infertility, stress, poor circulation, diabetes and many more. Ring and just talk to us to see how we can help. I love giving presents. All year round I have my friends and family in my head as I cruise around markets and so on. It is amazing how often I see something that is perfect for so and so, made by the stall holder. I gather them up and put them in my “presents” drawer for the giving day. To me, that is what a gift is; something I randomly find while the person is in my thoughts. It seems to me that most shops should just be called “Made in China”. I seriously often want to ask at the counter “Do you have anything in here that is made in Australia?” Even most of the mementos sold on the Spirit of Tasmania are made in China. It makes my head spin. There are several reasons why I care where things are made and they all come down to concern for our effect on life on earth. I do not want to be even a small part of reducing habitat for orangutans, platypuses, Tassie devils, elephants, frogs or our unique flora. Plants and insects are the life force of our planet and nothing can live without their enormous (but shrinking) diversity. I will not give gifts that are shipped up and down and around the world or made of fibres that last thousands of years or contribute to climate change / pollution / poverty/ or to harming the soil. Once you wipe out all those options, you are left with beautiful, local, natural things. Come and look through my wares, with your family and friends in your thoughts and you may find just the thing to give them and you can be sure that it is only going to do good and not harm to life on earth. Check out some of my suggestions below….